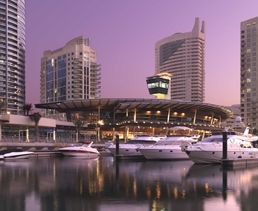 Set in the heart of ‘new Dubai’, Dubai Marina Yacht Club (DMYC) is one of the most renowned private yacht clubs in the region, boasting four distinctive marinas and an unrivalled setting. More than simply a yacht club, DMYC was founded to celebrate the finer things in life, offering a luxurious clubhouse and state-of-the-art marina facilities for a five-star experience. DMYC offers two floors of dining options which provide a variety of tastes, sights, sounds and flavours of the yachting lifestyle. Whether grabbing a light snack, lunching with friends or dressing up for a stylish dinner, the same standards of culinary excellence, service and personal attention pervade every aspect of DMYC experience. Regular gastronomic events tailored to the season ensure that dining at DMYC clubhouse is always a fresh experience.